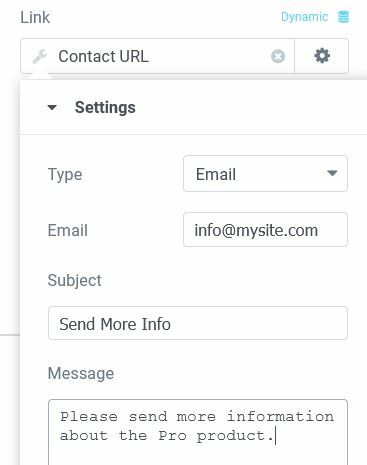 The Dynamic Contact URL feature provides a form to quickly create “smart” links from any widget that has a Link field, such as the Button widget. Select Contact URL from the Actions selections. This will add Contact URL in the Link field. Select the type of Contact URL you wish to use from Contact Via. You may select from Email, Tel, SMS, WhatsApp, Skype, Messenger, Viber, Waze, Google Calendar, Yahoo Calendar, or Outlook Calendar. Fill out the additional fields, as shown below, for the specific type you've chosen. Number: Enter the phone number to call. This will usually work on mobile phones. Number: Enter the phone number to text via SMS. This will usually work on mobile phones. Note: You need to enter the full phone number in international format. Omit any zeroes, brackets or dashes when adding the phone number in international format. For a detailed explanation on international numbers, read this article. Please keep in mind that this phone number must have an active account on WhatsApp. Username: Enter the username to message. Read instructions for finding your Messenger username and Messenger username link.